My grandfather was a woodworker, and one of the things he built for my grandmother was a dictionary stand. It has shelves for smaller books and a hinged, inclined top to hold a large book open. In their different ways, my grandparents both loved words. My grandfather was a storyteller who regaled guests at our wedding with a cautionary tale about doing a post-mortem on a dead calf en route to a dance when he and my grandmother were still newlyweds (we married on their 56th anniversary). My grandmother was a reader and a writer of long, many-paged letters on yellow legal pads, letters that spread into the margins and around the corners and occasionally onto the envelopes. When my grandmother died, I received the dictionary stand. It is a perfect piece of furniture. It carries for me family legacies of wordsmithing and of making things by hand--and it is darned useful. It holds books I've had for years, close to hand. 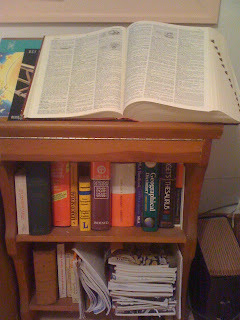 The fat dictionary that came with the stand is opened far more frequently than it would ever be on an ordinary shelf. The stand holds the first Spanish-English dictionary I bought in college, at the recommendation of a professor who became a mentor and good friend. I use online dictionaries. I go to the library and use big, fat, old printed dictionaries. There are new editions of some of my dictionaries, and I covet those. But adding new entries generally means letting some fall by the wayside--for instance, the most recent Pequeño Larousse ilustrado no longer has a full page of fencing diagrams. So I want to add to my collection, not replace anything. From a practical standpoint, translators need old dictionaries as well as new: not everything we work on was written last night. And dictionaries, like other books, also accumulate the marks of reading, and that's important, too. I'm working on a new translation project today, so out comes that Spanish-English dictionary, and by chance I find a pencil underlining from a previous project. I'm surprised I remember--it's just a little squiggle under the word--except that it was a word in one of the many proverbs included in The Potbellied Virgin, proverbs that were both a challenge and a puzzle. Those proverbs have left their traces, too. I think I'm more inclined to look for proverbs and sayings since working on that novel, both to use them and just to think about them. Certain sayings and favorite words become part of a family's legacy as well. My husband and children, who otherwise speak no German, have all learned one of my other grandmother's favorite sayings. I tuck it, in spirit, onto my dictionary stand along with the books. Today, my aunt reminds me, would have been my grandfather's 100th birthday. It's still early; I'll raise my morning cup of tea in a toast.